Hi all you amazing photo artists!!! You really out did yourself with the submissions for the March edition of Photo Art Friday! Incredible photo editing work! You can see in the PAF post that InLinkz has reordered the images according to most votes received. Several of us received no votes, so the last half of the re-ordered grouping really means nothing. Don't worry if your image appears near the end. All images in the last half of the grouping received no votes. So we're in great company if we find ourselves there! I really should send a prize set to each one of you - you all certainly deserve a prize for such amazing work - but that would defeat the purpose of our new voting option. So please accept my virtual applause and my "BRAVO!" I am also requesting an "Encore!" on the first Friday in April. The optional theme for April is "Quirky Selfie". It is a very flexible theme. Your selfie can be your shadow or your hand holding flowers, etc., etc., ... Be as creative as you like. You can read more about April's theme here. NOTE: A few people notified me that, contrary to the information I wrote in the post, they could not link up on Saturday or Sunday. My bad. :( I made an assumption that later arrivals would still be able to link-up their images even once the voting began. Apparently not. I've never used the voting option for InLinkz before, so there was a little learning curve. I'm sure there were others who were thwarted in their attempt to link-up and who left disappointed - and said nothing. I apologize to each of you. If you came to Photo Art Friday with the intention of linking up and were unable to do so, please email me to let me know at bonnie dot zieman at gmail dot com. I'd like to apologize personally. I promise to be very clear in April about the duration of the link-up and then separately the duration of the voting. The last thing I want is for people to spend time creating a beautiful piece of art and then not be able to submit it. Again ... so sorry. 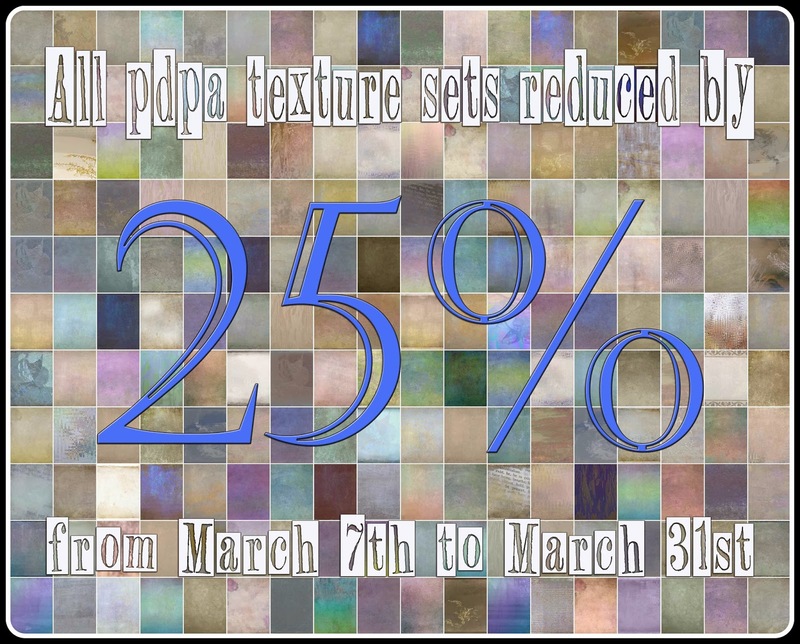 Just a reminder that all texture sets in both of my shops are discounted by 25% for the entire month of March. Take a peek here. I have to agree Bonnie! All of the submissions were awesome…it had to be difficult to chose just one! Thanks for allowing me to play along and Congrats to Teragram, your "painted velvet" was gorgeous! I am so thrilled. Thanks to all you who chose my abstract flowers as your favorite. And a bigger thanks to Bonnie and to all that entered. Your works are amazing. Congrats to the winner, yeah! Whoops! Looks like I missed the boat for Photo Art Friday. I went ahead and put mine up anyway, if you'd like to take a look.